Over the holiday weekend we experienced the new Trax line, and I feel so much more comfortable and familiar with it than I did before! I know so many people that are avoiding it because they don't know how it works, but it's really quite simple, and very convenient! We wanted to go downtown, so we decided to test out the new West Valley Trax line. We parked at the station across from Valley Fair Mall by the West Valley City Hall. We found out it runs every 20 minutes, and we had just missed it, so we had some time to just hang out. There was a train sitting there waiting, but wasn't allowing anybody on it yet. We thought that the train on the North side of the Tracks went Westbound, and the train on the South tracks went Eastbound, so we were waiting for the other train to come back. Apparently this is the last/first West Valley stop, so both trains go Eastbound and towards downtown. About 5 minutes before it was scheduled to leave, the train that had been sitting there opened its doors and allowed passengers on. Once you are downtown and want to get home, you have to pay a little bit more attention. We saw a guy get on the wrong train because he wasn't paying attention, and I felt so bad for him! When you are downtown, make sure you look at the marquee on the front of the train. If it says "Green Train", it will take you back to West Valley. If it says "Red Train University" or "Red Train Daybreak", it will get you to those destinations. If it says "Blue Train Sandy", then it will take you to Sandy. It's really quite simple: Just pay attention to the marquee and where you want to go. If I want to go from West Valley to Sandy, then at the 21st South Central Station, I would get off the Green Train West Valley, and wait for a Blue Train Sandy. Same with Daybreak or University. Just listen to the overhead instructions and you can get to where you are going! You can read more about Trax on their website. I love the Trax, I have written several articles on them. The latest is the Blue line from West Jordan where I usually park at the Midvale Station and go to the Library or University.Coming back, I was on the Red Line to Daybreak and had to transfer at Fashion Place to go to Midvale. But if I get on at 8351 S. on the Red line, it takes me directly to the Library and the U... Wonderful! 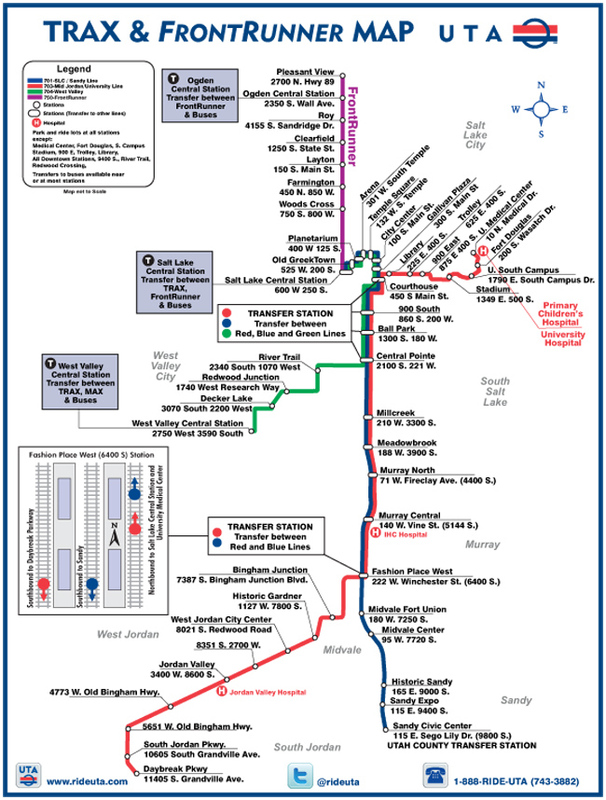 If you want to go to Gardner Village, Shopping and fun activities take the Red line to 7800 S.